Mencia, the red grape of the Bierzo region in the northwest of Spain, is the same as Portugal’s Jaen. And it’s a grape I really like. Now this wine is one of my best value wines of the year – it’s a thoroughly delicious, fresh, reasonably complex red of great appeal. Buying like this is another sign that UK chain Oddbins is on the way up again. I’ve recently discovered the Mercia grape, and really like it.I ‘m familiar with REBOLLEDO MENCIA 2007 which I think has a style not too disimilar to Cab Franc. I hope Oddbins do well, as like many people I’m sure I got into wine through them in the late 80s / early 90s. I think the fact that Nicolas grabbed the best sites didn’t help, while a lot of their core fans from the early nineties have probably grown up, got houses, cars and families and buy from leafy suburban Majestics rather than high street Oddbins. I’ve got a few near work so tend to drop in from time to time – the stores feel much less ‘confident’ than in the pre-Nicolas days. 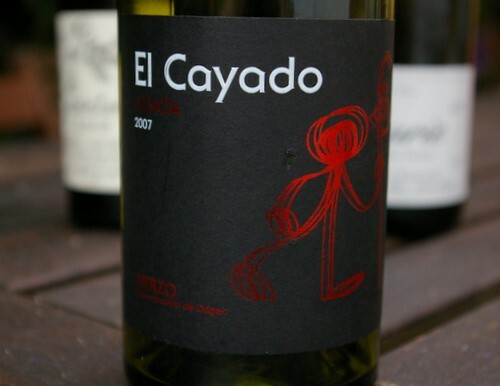 I looked for this wine at Oddbins on-line, at the Chiswick store and at the Pimlico store. No luck. Out of stock in the warehouse and at both stores I tried. Word was “it will probably be back in the warehouse in the future” and “it could be on the shelf at some other Oddbins store”.